Anybody have news on how the HCAP banquet went? Sorry for quoting such long text but given all this support I'm sure I could have done the flight 'Solo'. Dont have a PPL but I seem to do OK on Flight Sim and did get a few jollies in the Chinook. Firstly, I would like to pay particular tribute to my crew: Ewald Gritsch, whose company 3G Classic Aviation not only restored the Stearman, but who has worked tirelessly to provide full technical support of the flight. It wouldn't have been possible without him. My huge thanks to our crew for their dedication and endless goodwill - chase plane pilot, Markus Loeschenkohl, and cameraman, Matthew Wainwright. To Tim Kelly, who has done a masterful job managing the expedition media and communications; Mike Grey of White Rose Aviation for his fantastic service and support with all of our flight permissions and clearances along the route; and to Christian Schopf and his team from Fly to Sky for providing our support plane, the wonderful Pilatus Porter. Most significantly, my heartfelt thanks to my principal sponsors, Boeing and Artemis Investment Management for giving me the wings to fly Africa and around the world to Australia; with further support from ExecuJet, GIC Re of India, KM Dastur, Singapore Airlines, the Taj Hotel Group, Jeppesen, Livewire Digital, Cobham, Inmarsat, Pol Roger and our media partner, the Mail on Sunday. A special thank you to all the British Embassies, High Commissions and GREAT Campaign teams around the world who have supported us throughout the flight. And this flight would not have happened without the unparalleled support of HRH Prince Michael of Kent, Judy and Hugh Chilvers (Amy’s family), Michael Loveridge, Sir John Rose, Mustafa Koc, Ho Ching, Derrick Gunning and Dame Diana Rigg. There have been so many fantastic supporters behind this project over the last 12 months, so I would also like to thank a number of people: the Royal Navy (and especially First Sea Lord Admiral Sir George Zambellas), the Royal Air Force (especially Chief of the Air Staff Sir Andrew Pulford and RAF No1 Squadron), the Royal Navy & Royal Marines charity, the BWPA, IAWA and AWPA, RAF Akrotiri, Bryn & Craig, the RAF Meteorological Service (who have provided us with weather reports for most of the route), the Israeli Civil Aviation Authorities, Libby Bahat and ‘Avner the Ace’, Avi Barber, Prince Hamzah and Princess Basma of Jordon, SkyDive Jordan, Sultan Prince Salman of Saudi Arabia, Princess Reema Bint Bandar Al Saud, the Pakistan Air Force and Princely Jets along with Ghouse Akbar, Engro Corp and Habib Bank, Prince Nikolaos of Greece, the Indian Air Force and the Royal Australian Air Force and Professional Helicopter Services at Uluru. Might I respectfully suggest that she now considers starting to name-drop to further her cause (self promotion? ), in case she's in danger of using up her own precious supply of oxygen? Looking at that long list can anyone hazard a guess at what it all must have cost? Could the money have been better spent on flying scholarships? Did Boeing and Artemis get their money's worth given this picture? The question now is where does this leave TCT? Trying to pick up where she and Ewald left off having wrecked Boeing's centenary stunt? Perhaps regaling a few old codgers with one of those cruise ship talks mid afternoon to a handful in the audience? I doubt there will be any more sponsorship money for future events. The whole saga has turned in to a PR disaster. The Spirit of Artemis sits in a hangar at Farnborough instead of flying around the UK. HCAP have put her on a pedestal alongside Time Peake and the press are sure to revisit this. I have a question. On 1st October 2015 TCT set off from Farnborough in a blaze of publicity on her epic trip to Oz. She took off all by herself, alone in the airplane and then apparently flew to Le Touquet before continuing to Charleville in France. FAB to LFAT is a mere hop of only 120 nm, and a direct flight from FAB to Charleville is only 226 nm - hardly a challenge for a Stearman with extra tanks. Charleville is a customs and immigration airfield also. I wonder why Tracey stopped off at Le Touquet...or maybe that's where Ewald joined her? Would anyone know? I leave on October 1st, which is fast approaching as we have just under 100 days to go, and although we are in a great position in terms of planning and preparation, for a trip of this magnitude there is still lots to do. My beautiful 1942 Boeing Stearman, Spirit of Artemis, and I, will have to navigate 13,000 miles across 23 countries to make it from one end of the world to the other which is quite some expedition to organise. Sorry, it looks like I missed that the wind was across the RW at Le Touquet, so where did she land immediately after departing from FAB, and when did Ewald join her? Er...hang on a minute. Where has that newsletter come from all of a sudden? It's dated 28th January 2016 and has a 'New' tag against it meaning presumably, it's just been published. In fact, using wayback.com, it would appear that the 'news' icon on the birdinabiplane menu has been absent since at least 7th March this year and has now suddenly popped back again. So, retrospective editing has taken place to miraculously make it look as if TCT was saying it was a jolly old joint effort all along - just like it says in the HCAP bumph. When will they learn you can't lie on the internet? Watch the video, where Prince Michael helps push the aircraft from the hangar. She clearly states it is a journey she is embarking on and does not mention others. At the end of the trip Ewald is once again spirited away while she makes her address to the waiting media. Clearly in my opinion a set up to fool journalists in to thinking it was all solo. And talking of journalists it is only fair I now reveal apart from having a PPL A and H for north of 30 years I am also a retired ex BBC and Reuters journalist. Hence my dogged determination to get to the bottom of what has been the most amazing story I have ever encountered. I have not heard a peep from her lawyers but if it goes to court the result will be interesting to say the least. "I have not heard a peep from her lawyers but if it goes to court the result will be interesting to say the least." It's been designed as an 'out of reach' programme from the likes of the normal working class of people to do anything about it. They have used the media to their advantage. It's worked to some sort of degree because Joe Bloggs still believes it. They will watch the film and come away again believing it. Sure, the LAA are a grassroots flying organisation run by 'normal' guys. It's obvious something could be done at this level. Once you move inside the city, large institutions are 'out of reach' with the 'normal' guys, and just do their own thing irrespective, generally saluting with two fingers if you don't like it. That's the way it has always been and will not be about to change. Some 'players' even have a finger in each pie. This whole saga centres on well publicised solo flights that never were solo. Had it been public from day one that this was just another reality programme in the making no one would have cared a hoot and there would have been little or no publicity. We certainly would not be wasting our time on here. TCT claimed to be emulating two pioneering women aviators from the early days of long distance flying. Both flew alone and unsupported in British built aircraft. TCT has had massive funding and support and is now backtracking on her claims that her flying was event was meant to be solo. She also implied it was difficult to find a similar aircraft of the period to fly in Africa despite many examples of the DH Tiger Moth still flying there. Of course DH are not still around to provide sponsorship but Boeing are and their centenary was coming up. Could that have influenced the choice of aircraft? An aircraft from WW2 and far removed from the small DH? I am not some individual with a private grudge. I had never heard of TCT until I read about her on this site late last year after she left the UK. I have no interest in her apart from revealing the truth. I am not, as described in her press release ,an "associate" of Sam Rutherford. I have never spoken by phone to Sam Rutherford or met him. As I stated earlier I am a retired journalist hence my digging out the facts. And the facts of this story revolve around one simple word that means so much to all of us who faced it. Last edited by Mike Flynn; 28th Oct 2016 at 12:31. Perhaps someone should email that link to HCAP? Suggest that is sent to the press. It's already been sent to wiki. Always intrigued by the ratio of the funds raised in sponsorship/donations to finance these flights round the world versus the eventual funds allocated to the selected charities concerned. Whether TCT, Amelia (Rose) Earhart - the Pilatus PC-XII one, Polly Vacher, whoever, the costs of those 'round the world' expeditions versus the money raised for the charity concerned always seems a bit out of whack. Got an opinion on what would be a sensible ratio? Of that raised, 60% towards costs, 40% given to charities? Nowhere near I suspect, probably more on the 'raising awareness of X/Y/Z' front and there's barely any cash involved for that entity. "The Cape Town to Goodwood flight took two months to complete with 38 stops. 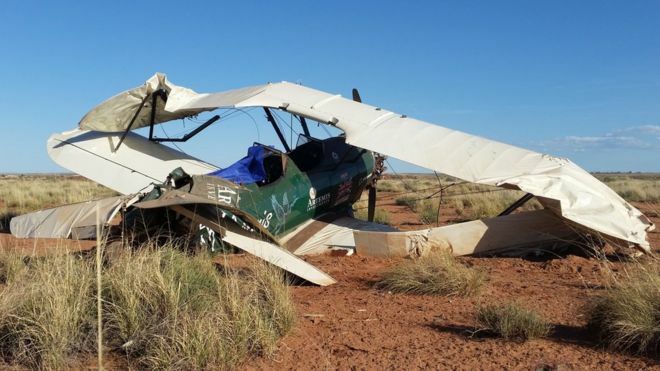 Tracey was supported by a second aircraft; a Cessna Caravan provided by Phoenix Aviation of Nairobi, which carried a logistics manager, an engineer and a four-man film crew." so the engineer was carried in the support plane. If he'd have stayed there there probably wouldn't have been quite so much kerfuffle? "In preparation for her solo flight across Africa"